I just heard about this index today, the Silicon Valley Venture Capitalist Confidence Index, which measures the confidence of Silicon Valley venture capitalists on a scale from 1-5. In 4Q08, the index hit its fifth consecutive quarterly new low at 2.77 out of 5. The index was started in 1Q04. 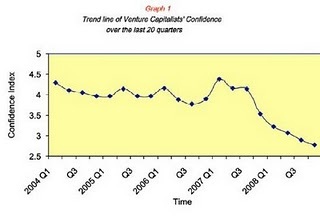 In summary, the continuing fall-out from the credit crisis and downward economic spiral (lack of exits, squeezed capital commitments, and fewer customers for portfolio firm products) has led to the lowest level of venture capitalists’ confidence in the 5 year history of this quarterly survey and report. However, it is worth recalling that the Silicon Valley venture industry endured the 2000/2001 Internet bubble and bust. And current increasingly stringent financing criteria and lower valuations may mean that many of today’s investments will eventually earn significantly positive returns. Further, a confidence in the resilience of entrepreneurs, and the unique support structure of the Silicon Valley entrepreneurial eco-system remains strong. This underlying confidence coupled with the belief that even stronger enterprises, tried by fire in this harsh environment, will emerge more vibrant and sustainable when the broader economic environment finally recovers, leaves cause for optimism in the long term resilience of the Silicon Valley venture capital and entrepreneurial machine. This entry was posted in Silicon Valley, Venture Capital. Bookmark the permalink.